Ecuador is a country where the Andes meets the Amazon, where the land straddles between two hemispheres. Ecuador has so much to offer: the beach, the wildlife, the mountains, and the jungles. I spent 4 full days in Ecuador mid-May, the end of their wet season. Going in, I didn’t know much about the country except my desire to go to the Galapagos Islands, which I completely ignored. After weeks of research, I’ve compiled the best things to do in Ecuador in just 4 days! Ecuador is one of the smallest countries in South America, therefore traveling from one end to the other end is not difficult. There is a generous amount of taxi drivers, buses, and tours. Due to my short time in Ecuador and how much land I wanted to cover, I hired a private guide. His name is Luis Gavilanes and he has been a driver for 15 years for the yellow cab, 10 years as a private guide/driver for LAG. He charged $150 a day to go anywhere in Ecuador. We started our day around 8am and ended the tour around 7:30pm. In other words, this rate is a steal! Tours can cost upward of $200/per person per day. Buses can be cramped and taxi drivers can be impersonal. Luis’ service was one of the best, he is native to the land, speaks English and can translate, and he built an itinerary fit for my adventurous spirit. (If you would like to get in contact with Luis, please message me for details). I enjoy eating with Luis because I got a glimpse of what the locals eat. He took me to a lot of tiny shacks, which is the reason why the restaurant names are omitted from my itinerary below. These are a few items I had during the week and you can find them at most restaurants. On a side note, most main entrées will include a side salad, fries, and rice. A community salsa is on every table and poured on everything (it’s very tasty). Aguado De Gallina – Chicken soup with rice, yucca, onions, vegetable, and your choice of chicken part. Cuy – guinea pig and usually served with potatoes. In Ecuador, the United States Dollar is used as currency. Change in coins can be given in either Ecuadorian coins or American coins. It is very important to bring small non-torn bills; $20 are seen as $100 in Ecuador and torn bills are not accepted in most places. Do bring lots of $1 for parking and tipping. ATMS/Banks are not easy accessible unless you’re in the city. Make sure you bring or take out as much as you will need during your stay. Each night, Luis drives us around to find a decent and affordable hotel. Our preference includes being in the city for easy access to restaurants and bars, a place that serves free breakfast, free wifi, and for a room that is less than $70, including VAT. A 14% VAT tax is included in all hotel/hostel stay along with a 10% service tax. Most hotels, if not all, serve free breakfast which usually includes, fresh fruits, eggs, bread, coffee, and juice. Most hotels are also equipped with free wi-fi. When I ask the concierge for a room, I was escorted to a vacant room to decide if the room fits our criteria. After my approval, I return to the front desk to complete our transaction. Most hotels prefer cash. There is usually a 2% charge for debit cards users and 4% charge for credit card users. Rooms will come with the bare minimum supply. There is usually 1 towel, 1 soap, and 1 shampoo. Remember to request for additional towels and toiletries before returning to the room. Quito – leave from Quito city. Cotopaxi – Cotopaxi National Park is where you can see volcanoes around you within the Andes mountains. Limpiopungo Lagoon – This lagoon is on the Quilotoa loop (including Cotopaxi). 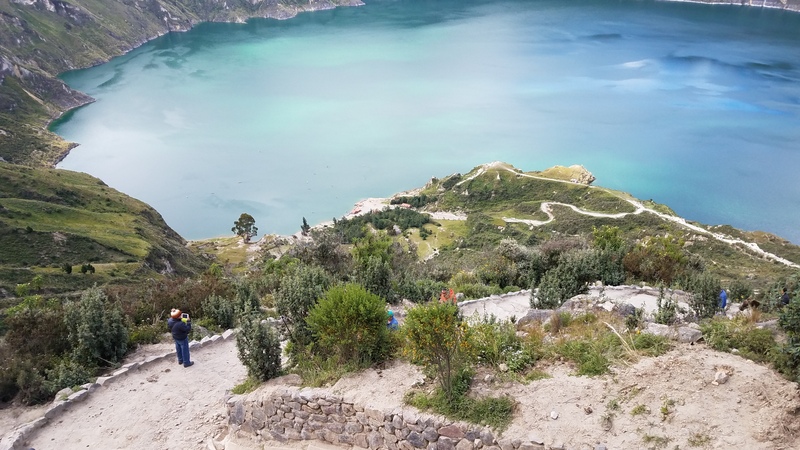 Quilotoa – The greenish crater lake that is a popular tourist destination. Baños – Spend the first night here in the city. Puyo – Amazonian city about an hour away from Baños. Otavalo – known for their daily street markets. Staying the night here. Laguna De Cuicocha – A beautiful lagoon in Otavalo. Not very crowded and about a 45 minute hike around the lagoon. click on dates for full itinerary.